I think I will do the same as last weekend and just update this post as I am going along. Got more binding done after the movie and also some small hand work that needed to be done on the skirt. Anyway, more progress! We are about to go out to the movies, but I did get all the petticoats onto the skirt. YAY! Things are moving along. 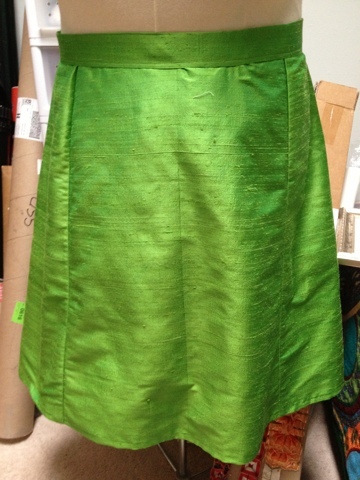 I have the skirt done. I was sad that I put that much effort into a really nice piece and it will never actually be seen in public. Ah well. I took some pics so you can see it in it's natural form. I am currently in the throws of franken-ing the petticoats on and it is a nightmare,so i need to take breaks to keep my sanity. We are going to go to a movie tonight so I doubt I will get to wings tonight, but soon!! More later tonight when I know where I land. 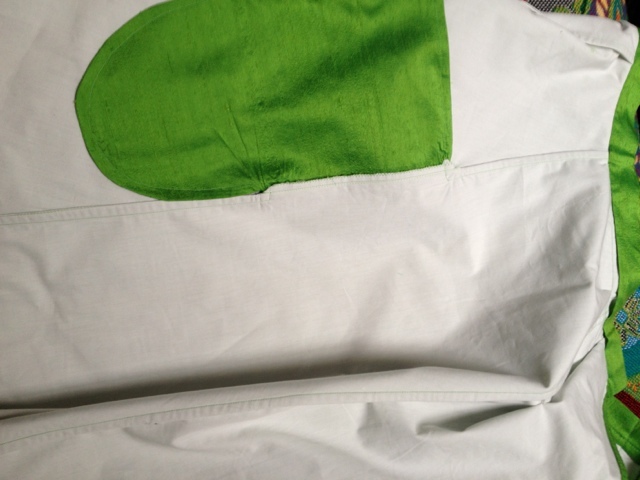 Ok, so I have the skirt flat-lined and I would say 80% sewn together. 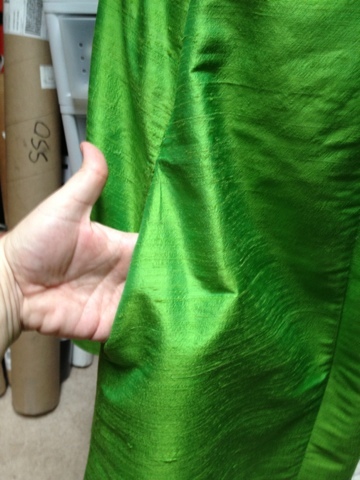 I have 2 side seams, the waistband and the hem to do and that is it. Then I can attach the petticoats to it. I sure hope this all works. More tomorrow. The corset is 1/2 way through the binding process and I am just waiting for my finger to stop throbbing every time I touch something to finish it. I hope to get that done tonight. You know, people gave me a hard time when I was saying that this would take the full 2.5 months that I had to make it, but it is actually pretty much right on schedule. Yes, I could have made it faster if I worked on it more in the evenings or cancelled plans and vacations. And yes, i could have made it faster if I took shortcuts and didn't do finishing or double side the wings, but that isn't my style. I am slow, but I think this thing will hold up really well, and I will be proud of it. I do have a "nice to have" list for add-ons to this dress. Some of them may happen now, and some of them may be a next time, we'll see. Sahrye is adding lights to hers, so that would be nice. I would like to sew antennae into the wig, I'd like to add some sparkle to the wings somehow, stuff like that. I don't need any of that to happen to be happy with it for this wearing though so I'm not even considering any of it until after the skirt is constructed and I have a chance to look at it as a whole.